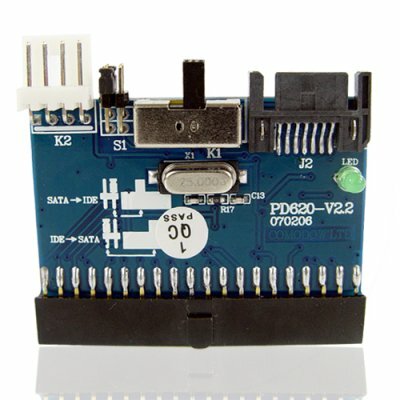 Successfully Added IDE to SATA Bi-Directional Convertor to your Shopping Cart. Are you stuck with a new motherboard and some old hard disk drives? Want to get some of the data off those old drives but finding the connectors just don't match up? A bidirectional IDE to SATA converter could be just what you need, for using SATA drives on an older IDE based motherboard, or IDE drives on a newer SATA based motherboard. The unit features support for the maximum IDE data rate or 150 MB/S, simple installation and compact design to take up minimal room inside your case. A simple, effective and valuable item to be had in any geeks arsenal, brought to you at a great factory-direct wholesale price and in stock in our warehouse, able to be shipped direct to you or your customers door today! Ik heb een sata schijf aangesloten op een IDE moederbord en het werkt perfect.